Comfortable to wear: made of the flexible metal hose with the positioning accuracy MIC + Structural Design + Durable. The Best Call Quality: Around 10,000 times Testing, the microphone boom rotates, 330 degree adjustable boom. The Hands-Free Headset with Comfort Fit Headband is designed for use with any cordless phone possessing a standard 2.5mm jack, Such as Panasonic Phones. The headset is an excellent way for you to talk hands-free while you work. Its boom-style microphone adjusts to an optimum level for your mouth. The headset is reversible you may wear it on either ear and it uses a comfortable, lightweight design and offers a 5-foot cord with a cable knob controlling the voice. 1.This 2.5mm Monaural headset has the VOLUME CONTROL function, doesn't have the MUTE button. 2.This headset can only compatible with 2.5MM JACK and MOST CORDLESS PHONE. NOT fittable for cell phone and 3.5mm jack smartphone. ✅DESIGNED - for use with Most cordless phones with a standard 2.5-millimeter jack; Boom-style microphone adjustable for optimum level. ✅Noise-Cancelling - Adopting hearing protection technology, Microphone noise abatement can reach to the aviation noise reduction level. ✅Comfortable to wear - The head lines can be telescopic up and down to adapt to head size. Made of the flexible metal hose with the positioning accuracy Microphone + Structural Design + Durable Material! 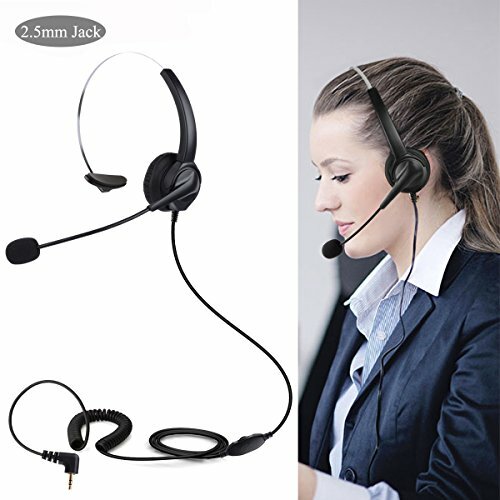 ✅Widely Applications - Hands-free Headsets for phone sales, telephone counseling services, insurance, hospitals, banks, telecom operators, enterprises, home office use and more usages. ✅The Best Call Quality - Around 10,000 times Testing, the microphone boom rotates, 330 degree adjustable boom; Helical headphone cable which will avoid damaging during the use. Headset headlines can be telescopic up and down to adapt to head size. If you have any questions about this product by SoulBay, contact us by completing and submitting the form below. If you are looking for a specif part number, please include it with your message.